How many foreign languages does your kid speak? None? Why is that? My daughter is still learning to speak her native language, but I plan to teach all my kids foreign languages as soon as possible. And here is why. 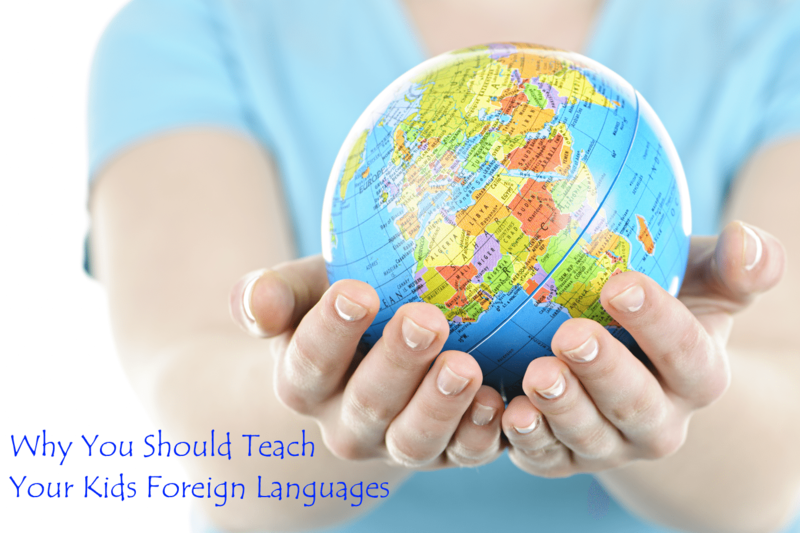 Three simple reasons everyone should teach their kids foreign languages. 1. It is easier to learn languages when you are young. A very important thing to remember here is that languages are much easier to learn when you are younger. Linguists agree that it’s a period before turning 12, and some say that children can start learning foreign languages as early as age 5. After this period of childhood, learning a second language can be a real struggle. 2. The more languages you know, the easier is for you to learn more languages. That might sound weird, but that is, in fact, a general rule. Teaching your child any second language will make it easier for them to learn a third (and fourth and fifth) down the line. 3. Your kid will be grateful for this later in life. No matter which second language you choose, your child will without any doubt be very grateful for this. A second language will give them a leg up in life, that’s for sure. This is why I will teach my kids foreign languages. That decision was easy to make. But how to choose the right language to teach your kids? You have to consider what particular goal you have in mind for this second language. Some parents teach kids foreign languages for cultural reasons because they want to pass on their native language while others do so because it is common in the area they live. These languages are the easiest for a child to learn because they are surrounded by them. If you pick a language that is supported by the surrounding culture, it will be easier for your kid to learn that foreign language. If there’s a language that you are a native speaker of or one that is spoken in your area, I would highly recommend teaching that language to your child. It will be easy to learn and at the same time useful to them. But don’t get so frustrated trying to choose the “perfect” language – you really cannot make a wrong decision. Start young – yes!! That is my main point.. They just get bored more easily when they are older. I think it’s awesome for kids to learn another language…..if only I knew another one! My friends kid is 3 and speaks fluent German and English. I would love to be able to do that! I was also using Rosetta Stone. It’s great! For many reasons, I believe that our son should at least know some basic words and phrases in various languages. However, my husband is totally against it. I will be sharing this post with him for sure. Why is he against it? I’d love my children to grow up speaking more than one language! Language immersion programs at school are fantastic for that very reason. Wish I spoke another language so they could grow up hearing it in the home! Here in my country all kids have to learn English in school, and later they can even choose to learn some other language too! I have been wanting my daughter to learn a second language…in fact, I’ve been wanting to learn one myself! It sounds like she is at the right age to learn and we can do it together! They catch on everything so easily when they are young. That is why I think it’s important to push them a little bit in that direction. I wish I had been taught a second language as a kid. I am learning one now and it’s difficult. I wish it was just something that was taught. Schools need to be more about skills – like budgeting. Which one are you learning? I am also trying to improve my German. I just know some basics – but it’s so difficult now. I grew up with a Danish mom and a German dad. Today I’m sooo happy and thankful to speak those to languages fluently! Absolutely this is important! My husband grew up bilingual, and while I didn’t, I really appreciate the languages I learned later on in life, and we want to start our kids young! I am also bilingual but I wish I learned more languages when I was younger. Now it just seems too hard. I am a hugs proponent of teaching children a foreign language. Right now my children are learning Spanish in school and I’m teaching them Greek at home. Marina, that is awesome. Greek is not really easy language to learn! I seriously wish I had been taught another language as a kid. I have tried to learn spanish and german but I haven’t had much luck with it. Yeah, I know what you mean. I feel the same. I tried learning German with Rosetta stone or Duolingo, but without much luck. Shame. Maybe we can try together next time? The best way for adults to learn is to watch Spanish language programs, or what ever language you are interested in learning. You will eventually pick up what they are saying just as you did as a baby when your parents spoke to you. It’s also a good idea to join a local language group. Meetup.com has lot’s of them. I agree! When I was younger I watched a lot of spanish soap operas, and in just few months I was able to understand everything they were saying! This is a great idea. I always wished I had learnt another language. Me too.. And not just one. I have cousins that know 6-7 languages. I wish my parents pushed me little bit harder to learn them. Can’t agree more! The more languages you know the more opportunities are there for you.. This article was great. As a Reading Specialist, I see how the power of language can expand a child’s mind. I love using word origins to help my students understand the meanings–clearly knowledge of other languages helps with this. We just tried a Spanish immersion class and it was so fun! I wish my elder two had taken an interest in different languages (we tried but they just didn’t want to know) we have taught my daughter little bits since being very little and she does enjoy it, but I don’t think we push her enough with it for her to remember them, I think her mum and I need to change that and start a language course with her. I think being able to speak more than one language sets you up in life to be able to travel more easily and even work in new places. Love this! My husband is from Poland, and I’m the only American that has married in/family member that isn’t fluent in Polish. We are trying hard to pass on the language and cultural traditions to our kids. it’s just hard when I’m the one with them the most and I don’t know the language. I’ll check out some of those books! Maybe you can take a class to learn at least some basics? There are even some great online programs for learning foreign languages, maybe there is one for Polish. You’ve raised some great and valid points here. I’ve wanted my children to learn at least one other language but I feel incapable of teach it properly. Perhaps we could learn together?! You could – but they would be much better in that then you :)) I tried and tried to improve my German, but I guess I am just too old for learning that. Totally true! I am trying to improve my German now but it’s so hard when you are older. I wish my parents were more focused on me learning it when I was younger. My perspective comes both as a parent and a classroom teacher: You are spot on with this one. My grands are very fortunate to be learning three languages (English, Armenian, and Russian) simultaneously as part of their daily interaction with their parents and grandparents, and I know their early learning experiences will do nothing but great things for them. I am glad that even a classroom teacher agrees with this 🙂 I truly believe in what I wrote. It’s so great that your grands are learning three languages!! That will be such an advantage for them later in life. Absolutely! We have enrolled our oldest daughter (currently a kindergartner) in a new school next year largely because she will be learning French as part of the normal day-to-day there. She’s always been a prolific talker (was born 10 weeks early and started talking EARLY) and we’ve gotten more and more serious about her apparent natural affinity for language. Just like you mentioned, we hope she goes on to learn multiple languages. Great post, thanks! I think you are doing great thing for your little one. If you noticed that she has talent for languages, just go for it – she will be grateful later in life! Wonderful post! I totally agree with you. I’m in the process of teaching my children Spanish. My parents spoke Spanish, but did not teach us Spanish. I know some Spanish, enough to get by, but I’m still learning things. My husband grew up around German speakers but does not know German. I know more them him. 🙂 I lived in Germany for a few years. I think it would be great to teach the kids both. We’ve been considering purchasing Rosetta Stone the kids have apps to help now. Hopped over from the Ladies Collective link up – great post! We’re teaching our little one or native languages – Portuguese and Spanish – along with English. I’m surprised I still get negative comments about how we’re going to confuse him with all the languages… how do you explain European kids who speak 4, 5 languages fluently? That is bullsh** 🙂 Don’t listen to them! Here in my country almost everyone speak three languages – without any problem! It’s so great that you can teach your little one three different languages, and no, you want confuse him! I wish that we had focused on this when my daughter was young. My husband speaks English as a second language and my daughter was exposed to his language but we did not really focus on having her speak it. Now, she goes to language classes but it will be far more difficult for her to become fluent. Yes, that is often a problem – starting too late. But hey, I think that she can still become fluent. It would be much easier if she started it earlier, but it’s never too late. As a former preschool teacher….thank you!! I would speak both English and Spanish in my class and the kids would pick it up in a snap! We had some days where we would have “only Spanish blocks”. I’m very good at reading a language once I know how pronunciation works but I am terrible at writing or speaking more than a few phrases. I’d love to be fluent and wish my parents would have spent more time teaching me when I was young. We’d see so much more success in foreign language if we 1) taught it differently and 2) taught it in elementary school instead of high school. LOVE this article! Meaghan, I completely agree with you! One thing that is good about my country is the fact that all kids have to learn English as the second language in elementary school – and later they can even choose to learn third language. They really pick it all up in a snap!! We are considering putting our girls into a dual immersion program where they will learn a language starting in 1st grade. Such a great experience. Still looking into it, but I agree with you on this topic. Elizabeth, dual immersion program sounds really interesting. I wish we have something like that here! This is so smart to do young. We haven’t started yet, but we live in a Hispanic area and it just makes sense for her to learn Spanish. Hopefully we’ll get started this year. It’s easier when you live in area where they speak other language. I think she will catch it up so fast! Carrie, I am so glad you liked it. And I am happy to see that lots of people agree with this post and can see the importance of learning kids foreign languages. That is so great! I completely agree with you – they just soak it all up at that age! My kids are bilingual but then most kids in Malaysia are. I am trilingual. Great post, BTW! That is great! I am also bilingual, but lots of people here are even trilingual like you. Which languages do you speak? I majored in French, and I lived in France for my first two years out of school. My husband and I don’t have kids yet, but when we do, they will learn French. I’ve already told my husband we will have a live-in French au pair by the time our oldest is 3 or 4 because I want our future kids to learn from a native speaker, not from me. I am sorry, I thought it was enough to have a badge on my page, not on my post! I have considered teaching my kids Spanish but have been slightly hesitant. This post is encouraging me to go ahead and do it. My girls are 2 and 3, so I best get to planning and teaching! Thanks for this post! Just go for it. You will be glad you did that! Absolutely! I plan (hope to find time to) teach my kiddo Russian. I speak it decently enough when around my relatives, but forget it when I’m away from them. I hope to get him exposure to that. I am on the absolute same page regarding this. We moved to change school districts so she could get into the French Immersion stream in Grade 1. This is fantastic! We’ve been teaching my daughter a little Spanish, but I don’t remember as much Spanish, German or Italian as I used to. I wish they taught language in school at a younger age in this area. Absolutely, could not agree with you more. I wish my own second languages were good enough to teach my daughter but my accent is just not good enough. Can’t wait to take her overseas to experience languages first hand! I completely agree with you. There are many great reasons for kids to learn other languages and you touched on most of them. So important to open their minds and help them grow. I speak Spanish fluently and my kids were doing Mandarin immersion until the school district dismantled the program and replaced it with a mediocre substitute. I am still thankful they are learning a language because ii really believe it exposes them to new cultures and makes them more creative learners and out of the box thinkers. Great post! Good stuff. I’m always fascinated with language and learning. Very good post. Great post! It’s very important to teach kids a World Language. Our family and friends speak Spanish, Portuguese, and English. My toddler understands and speaks all three. At first I was worried that she would be confused, but it’s nothing to her. We also watch a lot of the Baby First shows in Spanish and English. South Florida cable companies give you lots of Bilingual options. I completely agree with this. We were fortunate enough to be able to live in Italy. Our daughters were 4 and 6 when we arrived. We enrolled them in Italian elementary school. It was NOT easy — not as easy as we had been led to believe — but I am so thankful we stuck with it. Both daughters (now 20 and 22 years old) are fluent in Italian. Even though my husband and I were in our 30’s, we were still able to learn the language with A LOT of effort. I love being able to speak a foreign language! Thanks for sharing at the Inspire Me Mondays Link-Up. It was great having you with us! I think the easiest way to learn new language is if you live in other country, so you were really fortunate. Well, it’s never easy, but I know my daughter will be thankful one day because we stuck with it! My kids learn a little in school, but I’ll have to research this more. Thanks for linking up to the Bloggers Brags Pinterest Party! I’ve pinned your post to the Bloggers Brags Pinterest board. I totally agree and I will add to your list that the world is getting smaller and having a second language provides your child with extra leverage and potential. My toddler had been participating with Spanish story time at our local library, but last week she started her fist immersion program. Mommy is learning too. Great post, Yes learning more than one language is always best. thanks for sharing with Hearth and soul blog hop. I appreciate all the tips and I completely agree which is why we start foreign language next year. Thank you so much for sharing this at the #SmallVictoriesSundayLinkup!